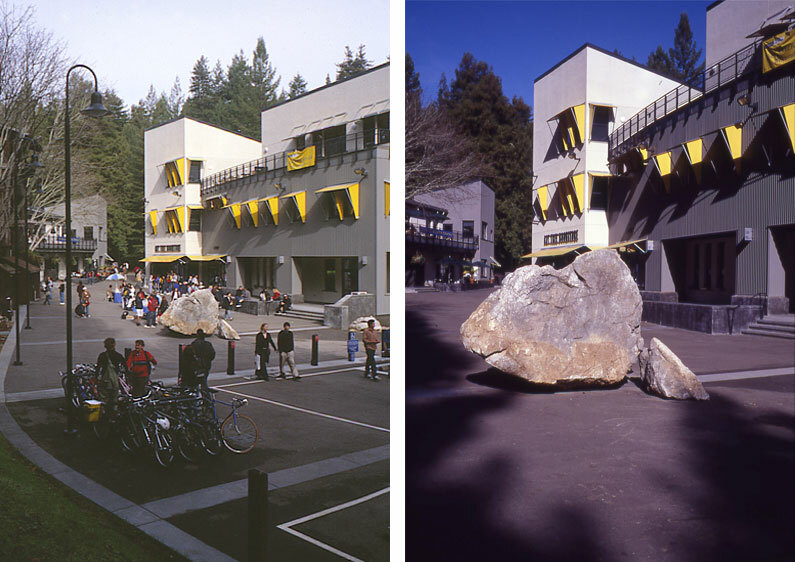 Quarry Plaza is the heart of the Bay Tree Bookstore complex at UC Santa Cruz. The plaza, with adjacent bookstore, restaurant, career service offices and Graduate Student Commons, is the major crossroads and meeting place for students at the core of the campus. The design of the plaza integrates pedestrian areas, handicapped access, parking and transit operations into a single space that unifies the site. Large boulders from the quarry are spaced throughout the plaza, providing informal seating and a counterpoint to the simple palette of asphalt paving and concrete banding. Native plants, including coast redwoods, bay trees and ferns integrate the project into the forested site.